The ecommerce industry is booming! But when people think of ecommerce selling, they tend to just think about the B2C sector. They forget that ecommerce is not just for B2C businesses. In fact, Businesswire reports that by 2020, B2B ecommerce sales are predicted to be more than two times higher than global online retail sales. Despite this, many wholesale businesses are still hesitating to embrace ecommerce and risk losing touch as the marketplace changes – rapidly. Competing wholesalers already selling online could chip away at their market share, offering a more accessible product range and transparent pricing. They could be left behind by suppliers and distributors who have adjusted their processes and systems to meet the requirements of B2B ecommerce, and want more efficient and forward-thinking partners. The B2B ecommerce marketplace is very price transparent. So in order to remain competitive, you may need to look for new suppliers and procure inventory from further afield to get the best prices. As suppliers are also increasing their online sales presence, you can take advantage of attractive prices and readily available products. It’s easier than ever to set up a global supply chain whilst maintaining low operating costs. However, increasing the complexity of your supply chain can also have serious implications on your logistics, inventory management and procurement processes. The larger your portfolio of suppliers and the more extensive the supply chain, the more difficult it can be to manage them effectively. It may no longer be possible to efficiently compare prices, manage supply terms and arrange deliveries manually. Wholesalers who want to ensure supply chain expansion success are investing in software, such as procurement platforms, warehouse management systems and logistics management software to automate these processes. Every one in five pounds spent with UK retailers is now online (The Telegraph), so it’s safe to say that most people know what to expect from a good ecommerce shopping experience. B2C ecommerce retailers are investing millions of pounds in building intuitive user interfaces and designing the best online shopping websites – raising the bar in terms of customer expectations. This means that ecommerce wholesalers entering the marketplace need to play catch up. To attract and keep customers you need a user-friendly website that’s logical to navigate, simple for finding products and offers easy and secure payment functionality – or face abandoned baskets and lost sales. Customer satisfaction and customer relationship management are the key buzzwords here. Not only do ecommerce companies need an attractive online presence, but they need to retain customers by processing orders quickly, efficiently, and correctly. This requires optimised inventory processes that work in real-time. It’s therefore critical for B2B ecommerce wholesalers to have a real-time overview of their stock situation, so that the inventory quantities displayed in their online shop reflect the actual stock availability. Cancelled orders, returns or reservations also need to have a “live” impact on these inventory levels. For such accuracy, wholesalers require a warehouse management system (WMS) or enterprise resource planning (ERP) system to provide accurate and transparent stock management. Additionally, eCommerce customers are very price-sensitive. Therefore additional expenses such as express delivery have to be minimised since these costs cannot simply be passed on to the customer – so these end up reducing to your own profits. Order processing should be handled with as many orders as possible together all at once to minimise additional costs. It’s one thing to know what item’s are in your warehouse, but another to make sure you have the right amount of the right products in stock to meet customer demand. 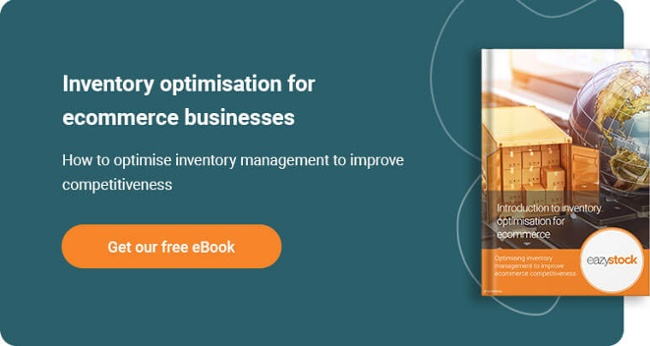 Optimised inventory management is critical for ecommerce businesses to ensure product availability and keep customers happy. But with ecommerce being a much more transparent and therefore unpredictable marketplace than traditional wholesale, this can become a complex challenge. For example, if a competitor adjusts the price of one of their products, this is instantly visible to all potential online customers and will potentially lower the demand of your competing product. If your forecasting and replenishment processes are not adjusted you could find yourself over ordering and with an excess stock issue. With a product portfolio of hundreds or thousands of items it’s impossible to manually compare your prices with those of the competition and then adjust your stock rules on a regular basis. Leading wholesalers are therefore looking to technology to help. Whilst ecommerce platforms can highlight competitor price changes, inventory planning software, such as EazyStock will automatically identify changes in product demand. You can then decide whether to adjust your price to meet the competition, or adjust your replenishment orders according to the new demand. B2B ecommerce customers are very price-sensitive. Wholesalers therefore need to make their operations and logistics as lean and efficient as possible. One area of focus should be around improving the supplier order management process, as this can lead to big improvements on your bottom line. Optimising your supplier orders is crucial for a number of reasons. Firstly, many wholesalers now have a global supplier network which means they have long lead times to manage. It’s therefore imperative that order quantities are accurate and will meet the upcoming market demands, as rush orders are simply not logistically possible. Secondly, wholesalers want to ensure they are placing cost-effective orders e.g no one wants to pay to ship half-filled containers, it simply uneconomical, but at the other end of the spectrum you need to take account of minimum order quantities (MOQ). Thirdly, suppliers like to plan their manufacturing and fulfilment schedules. Therefore customers who can provide accurate mid and long term orders will receive accurate and punctual deliveries and be in a position to negotiate the best deal. Take into consideration supplier lead times and supplier delivery calendars. For example, if you only place orders from a certain supplier once a week, the system will adapt the order quantities accordingly. Suggest your optimum order quantities, considering MOQs and future demand. Calculate the most economical way to fill a container, by identifying the items that are most cost-effective to add to the order. Keeping these best practices in mind from the start will set you on the path to success, but they can only truly be implemented by relying on modern software solutions for support. At EazyStock we focus on providing market-leading inventory optimisation software. Contact us today to chat with our team about how we can help. First published on 01 December 2017, updated April 2019.